Home > Safety & Environmental Help and Guidance > HAVS Assessments > What are the Vibration Exposure Limits and Values? What are the Vibration Exposure Limits and Values? The Control of Vibration at Work Regulations 2005 is based around the concept of exposure, as it is the amount of vibration exposure, not just the amount of vibration that causes injury. work for less of more than 8 hours as the calculation explained a bit later on take care of this automatically. regulations to determine whether or not further action is required. The following table shows the levels of exposure given in the Control of Vibration at Work Regulations 2005. Make every effort to reduce the exposure to below 2.5m/s2 by organisational (job rotation) or technical (vibration engineering) measures. employee may be exposed to in any 8 hour period and there are no exceptions! What this means in practice is that if someone is found to be exceeding this level of exposure, then work must immediately stop and actions must be taken to make sure it doesn’t happen again. The main actions required by the law are based on assessing the A(8). This is an often misunderstood, yet fundamental point, which if not observed, will invalidate any risk assessment. In fact, vibration exposure is just like any other form of exposure, for example, dust, gas, radiation and even sunlight. not however say anything about how brown (or burnt) a person might get as this, in turn depends on how long they stay in the sun. If the sunbather spends 4 hours in the sun, then they have had half of the available sunlight so it would be logical to take half of the number as the exposure figure. Castle Vexo H. The A(8) is then the proportion of that Aeq relative to the time of exposure. There is a formula to calculate this as it is not simply a direct proportion, but the principle is the same. work for longer, the level allowed goes down. that if you want to limit someone’s usage time on a tool, then you will have to significantly reduce the time, to have much effect at all on the exposure. As long as you have a vibration magnitude level and an accurate exposure time, translating this into HSE exposure points in easy. 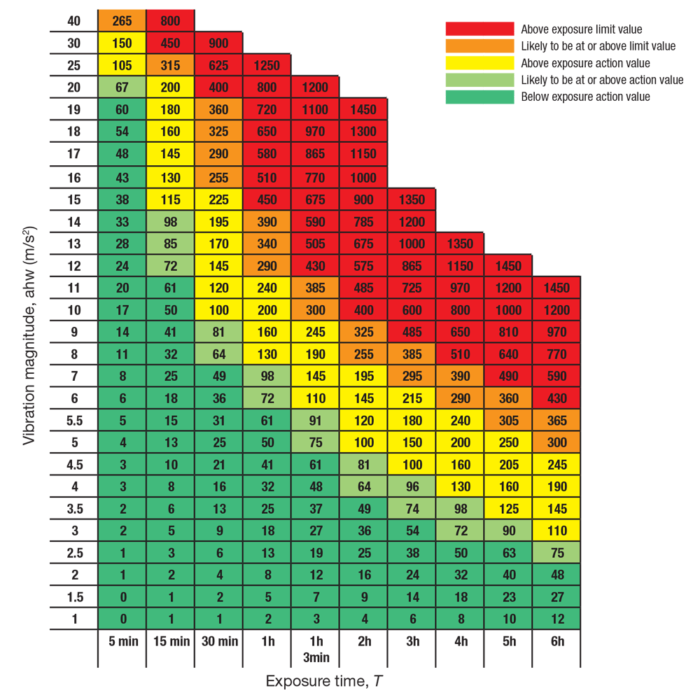 For the most common exposure times and vibration magnitudes you can use the table below. 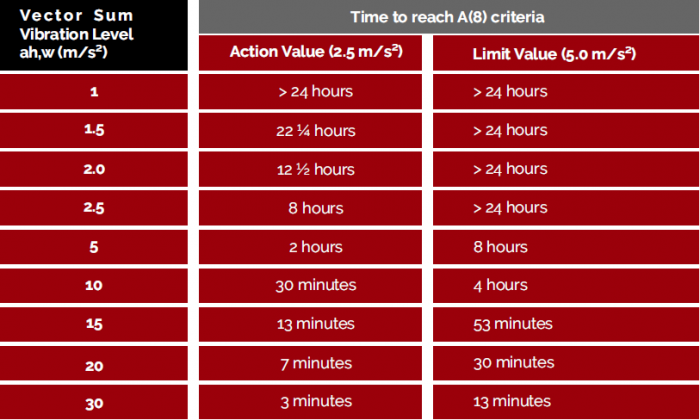 Simply cross reference your exposure time with your vibration magnitude and you can not only find the exposure points, but also which category the points falls in. For example, an operator working for three hours on a tool emitting a vibration magnitude of 9m/s2 would translate into 485 points.